The killings in Colorado and at Sandy Hook school were committed by certifiably insane individuals. No background check can determine a person’s sanity. If seeking the advice and care of a psychiatrist and psychologist would disqualify a person from gun ownership than their privacy will have been invaded in ways prohibited by medical ethics and the constitutional right to privacy. Police cannot arrest anyone on the suspicion they’re nuts. The only protection against them is a sane armed gun-owner. It has become a cliché to say that Barack Obama has become the greatest gun salesman because, as noted in a December 2012 report by CNSnews.com, “Compared to the number of background checks completed from January through December of 2011, all but two states saw net increases in gun sales in 2012.” Background checks to ensure that those with criminal records are a good idea, but criminals or crazy people can always get their hands on a gun. The Sandy Hook murders were perpetrated by a lunatic using the legal guns purchased by his mother. She was his first victim. “Washington, D.C. saw the largest year-to-year increase,” reported CNSnews.com, “with sales jumping 49.7%. Wisconsin followed with 45.5%, then New Jersey with 42.5%. New Hampshire with 40.9% and Rhode Island with 39.3%. The largest increases occurred in Georgia, Oregon, New Hampshire, Texas and Montana. In 2011 gun owners in America outnumbered hunters by 5 to 1. Hunters constitute only 15.9% to 18% of the estimate 70-80 million gun owners. Together they owned an estimated 300 million firearms, about 100 million of which were handguns. That is one hell of a voting bloc! The members of Congress know this. Writing in January, Wall Street Journal columnist, Kimberley A. Strassel, castigated “the elites” noting that the “one issue on which Congress still resoundingly agrees” is gun rights. The so-called debate over gun-control is led by the most elitist of all, Obama. A new gun control law on top of the 1,100 that already exist is dead on arrival in Congress. Harry Reid, the Senate Majority Leader, knows this. Even Obama knows this. So why is he going around the nation giving gun control speeches? It is the old magician’s trick of diversion and distraction. Gun control has no priority in a nation awash in debt, concerned about illegal immigration, and even threatened by the insane leader of North Korea. There are harsh, irresponsible and irrational gun control laws being passed in heavily liberal states, but they can and will be repealed in time as political control passes to legislators who get elected running against them. The Wall Street Journal reports that “This year, five states have passed seven laws that strengthen gun restrictions, while 10 states have passed 17 laws that weaken them, according to the Law Center to Prevent Gun Violence, which tracks and promotes gun-control-laws. 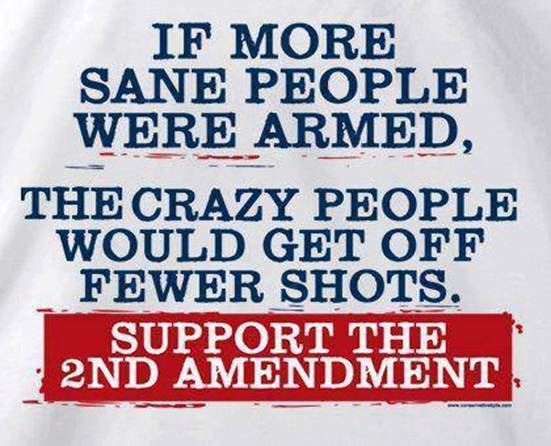 Nothing can be done to stop the crazies, but the vast numbers of gun owners are not crazy. They are, however, worried about a government showing signs of trying to take their guns away. Elections are a defense against such actions. Expanded background checks will be abused. First instance of abuse is where the background checks are used to create in illegal national gun registry. The powers that be... can also lower the bar so that a person with a small misdemeanor for a bar fight back when they were in college is considered a prohibited person. In some states / cities excessive speeding or downloading a lot of music can get you a felony charge. Felonies are no longer restricted to violent crimes. How long before spitting on the sidewalk prohibits you from owning a gun? Domestic violence is being stretched to include just grabbing someone's wrist or shoving someone out of your way as you walk out the door. Something as minor as a wrist grab can be used deny a person their Second Amendment Rights. No end to the amount of abuse that background checks will eventually lead to. In NYC if you have a gun permit, the police randomly call your house and ask your family members if you every display any signs of stress or great anger... and then pick at that. The wrong answers by your family will get your permit revoked. The purpose of the Second Amendment is to prevent future tyranny. The purpose of the Second Amendment is to arm people in order to prevent future tyranny. They need the tools to do this. The term "Well Regulated" in the Second Amendment meant "Well Manned and Equipped " in 1791 as was determined in the 1939 United States v. Miller case after referencing the autobiography of Benjamin Franklin. The concept of Government Regulation, as we understand it today, did not exist at the time. United States v. Miller also determined that the term "Arms" refers to "Ordinary Military Weapons" (not crew operated). American Citizens have the right to Keep and Bear, which means Own and Carry, any weapons that a soldier carries into battle. That includes past, present and future weapons. A Militia consisted of armed volunteers willing to fight with their personal arms and not under government control. The 2008 Heller v. Washington DC decision reaffirmed that the Right to Bear Arms was an Individual right. The 2010 McDonald v. Chicago decision reaffirmed it yet again and made it clear that it applies to every state, every city and every town in the United States. To limit the Second Amendment to muskets would be the equivalent of limiting the First Amendment to writings in quill pens. Liberty is worth the risk of death! Any student of history can plainly see that America is in dire straits. But three things just might save us yet: lots of guns, lots of land, and the grace of God. We've got the first two; let us pray for the third. Alan - you didn't answer your own observation. Why is Obama carrying on about guns where there are clearly many more critical issues facing your nation?